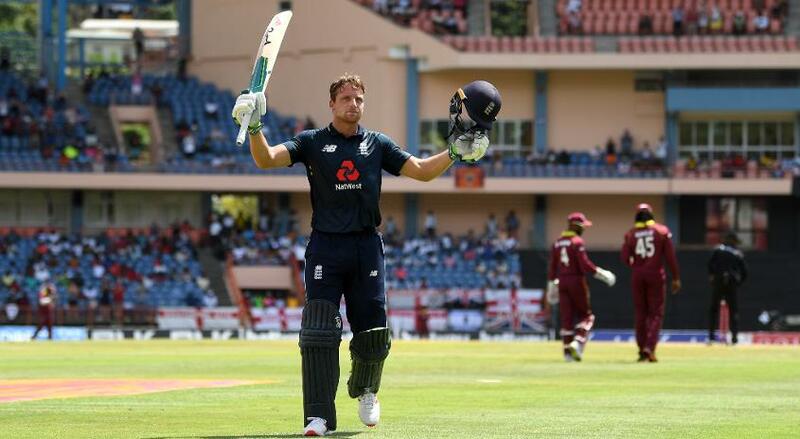 Jos Buttler, the England wicket-keeper batsman, has stressed on the importance of playing positive cricket if a team has to go far in the ICC Men's Cricket World Cup 2019. Placed No.1 on the MRF Tyres ICC ODI Team Rankings, England are favourites to win the tournament, which starts on 30 May, at home. Since the last World Cup, when they were knocked out in the group stage, they've turned around their style under captain Eoin Morgan, and have set a string of batting records by going big and hard right from the start. Recently against the West Indies, they posted their fourth 400-plus total since the last World Cup – South Africa is the only other team to have managed such a high score in that period. Buttler was one of the stars of that record-breaking game, dazzling with 150 off 77 balls in a total of 418/6. England end on 418/6 after a smashing a world record 24 sixes in their innings! “Getting to No.1 was a goal ahead of the World Cup,” Buttler told reporters. “Now, it is about staying true to what we’re about and continually getting better and trusting that style, which will stand us in good stead at the World Cup. "It won't be a side that plays cautiously that wins the World Cup," he said. "Even in knockout games, it will be a side that plays some brave cricket and smart cricket. If we [England] are at a crossroads, we've been going down the positive route." Sometimes you hear people talking about going to another level. Why can't you just stay at peak level? Buttler's good form has coincided with the team's rise and has set them up nicely for the World Cup. It began with a string of half-centuries in the Indian Premier League in 2018, where he was promoted to open, and subsequently led to a Test call-up. In the past 12 months, Buttler has averaged 40.78 in Test cricket and 63.44 in ODIs. Now, as he gets ready for another edition of the IPL with Rajasthan Royals, he's not worried about "peaking" too early before the World Cup. "The idea of peaking isn't really an idea that sits naturally in my mindset," he said. "Sometimes, you hear people talking about going to another level. Why can't you just stay at peak level? "Someone like [Virat] Kohli scores a hundred every game. He doesn't think: 'Ah, that was okay, I'll peak at some point'. Just do it every day. That's the sort of mindset I've been wanting to hit." Virat Kohli, the India captain, has launched a stern defence of former captain MS Dhoni, saying it was “unfortunate to see so many people going after him”.